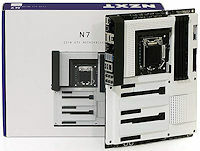 NZXT, a company much better known for products like cases, power supplies, and coolers, is dipping its toes in the motherboard waters with an Intel Z30 based motherboard named N7. The N7 is nearly completely covered with shrouds exposing only the pertinent parts, making for a unique looking motherboard. We’ll put it through its paces and see where it stands after our testing.